When specifying windows to use in single residential projects, we often encounter window manufacturers who propose changes to the glazing specifications when we are requesting window supply quotes. 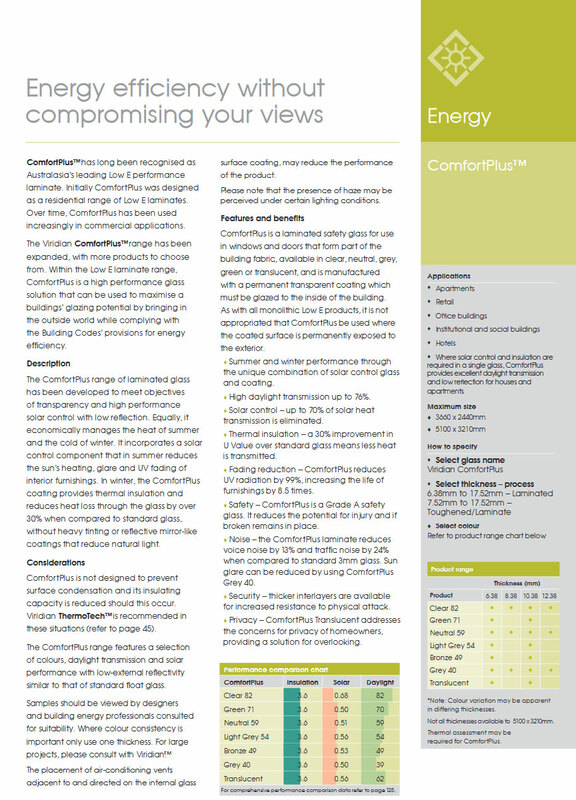 We were told during the most recent occurrence that low-e glass is superior to double glazing. Is this really true? To be able to answer this question, we need to start out with the question of what is the glass attempting to do? We may assume that all windows try to keep water out so the issue then becomes how it responds to solar gain. The manufacturer’s statement, in my above example, was based on an assumption that was incorrect. Possibly through the experiences he has had with the buildings that he has worked on, he made the assumption that the windows needed to reject heat – i.e. that there was a tendency for the building to overheat. Emissivity is what the “e” in low-e means. The low emissivity (low-e) coating means that less heat will pass through the glass than would normally be the case (compared with a situation where standard float glass was used). Also called IGU, double-glazing is a type of insulated glazing unit. Two sheets of glass are contained within a sealed unit that has a small air gap that is between the glass. This air gap works as a buffer in between these two materials which reduce heat energy flow through the IGU. Often the air gap is filled up with argon, which is an inert gas, as it reduces heat glow even further. Double-glazing does a great job at reducing the flow of heat, which works to maintain heat in winter inside of the building, and during the summer helps to reduce the flow of heat into a building. Low-e glass may be useful if heat needs to be rejected by a building. When the sun is hitting your window not as much heat will transfer into the room, which during the summer is a good thing. However, is passive solar principles have been used to design your building,and you relying on north facing windows to help keep you warm during the winter, then you are going to be very disappointed and will need another heater or jumper. The flow of heat through glass will always be reduce by the low e-coating, even when that’s what you want. Double glazing also does a great job oat maintaining heat inside of a building. However, during the winter, it allows for greater heat gains as well since there is a tendency for the glass to have a higher SGHC value (discussed below). This is how much lights gets through glass. The more light that gets through, the higher the number is, although that isn’t the same level of heat that is allowed through (see SGHC). When the two numbers above are looked at, the double-glazing allows more daylight in (80 vs 59) compared to low-e laminated glass; this is a 35% increase of daylight. This refers to the total percentage of radiation that gets transmitted via the glass, which is what keeps you warm during the winter, but that can overheat you during the summer as well. Double glazing has a 0.24 higher SGHC, which is a 47% increase of solar heat gain, which during the winter can be very useful. If you have a well designed home and it is shaded appropriately, then low-e glass could possibly do more harm than good. But if you are not able to provide an adequate amount of shading during the summer, it might be possible, on balance, that low-e glass will be your best option, i.e. if your summer cooling load is greater than what your winter heating load is. Just because you need to have low-e glass, that isn’t a sign or a poor designer or failed design. A site has many variables that can conspire against having a good passive design, however you do need to be mindful of the tendency to revert to technological fixes at times when changes in design might be more cost-effective and effective overall. Although low-e glass does tend to be less expensive compared to double-glazing, it also will lower your winter heat gain which can lead to needing either (a) more mechanical heating or (b) bigger windows. The larger windows solutions then can end up creating additional heat loss problems which can result in a downward spiral when it comes to performance combined with increased costs. If you provide adequate shade to your windows, it should eliminate the need for the glass to be coated. Good passive design, as always, should be the very first rung in the design decision hierarchy, while technological fixes only should come after passive (i.e. inexpensive) options have all been exhausted first. In the right situations, low-e is an excellent product; but unfortunately many within the industry have opted for easy solutions in order to solve issues that poor design have caused. It isn’t necessary for great design to be expensive; what it does take is considerable thought and thoroughly assessing the task that is at hand.